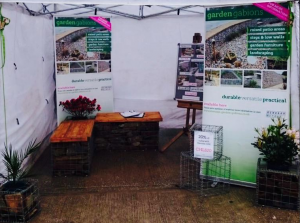 Cornwall Home & Lifestyle Show 2015 - Devoran Garden Gabions Ltd. 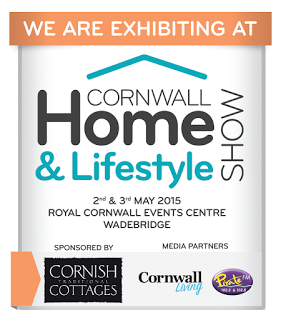 This year, we decided to exhibit our range of Small Garden Gabions at the Cornwall Home and Lifestyle Show 2015. The 2 day event took place at the Royal Cornwall Showground over the bank holiday weekend on 2nd & 3rd May. The event was organised by Live Events South West and showcased the best of Cornwall’s home related products and services. We have always been interested in exhibiting at the show but had yet to actually sign up. This year, when the offer came round, I wanted to give it a try and booked the show at the end of February which gave us just over 2 month preparation time. I designed the stand using our smaller garden range as these are best suited for private garden projects. 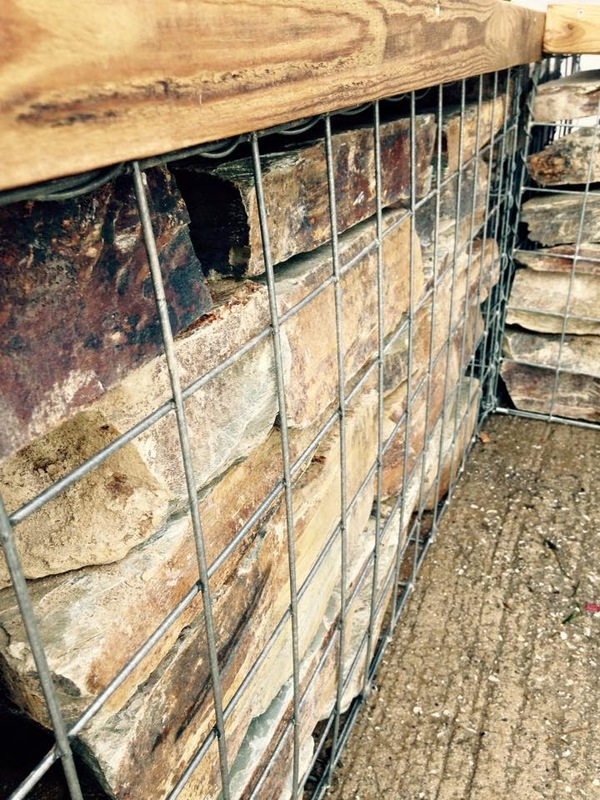 I wanted to show customers how they could use gabion baskets to transform their garden into a more useful living space, that was both functional and stylish. I designed a gabion seating area which comprised of 2no. 975mm x 450mm x 450mm gabions, and 1no. 450mm x 450mm x 450mm gabion to form the corner planter. Devoran Garden Gabions stand at the CHLS 2015. For the seat tops, I used reclaimed pallet wood which was free and readily available. If you do have any trouble sourcing pallets they don’t cost a lot to buy direct. They were really simple to build, and you don’t need to be an expert joiner to make them. The seat tops were made by cutting 2 lengths of 80mm wide wood to 450mm long and laying them vertically across the gabion baskets (front to back) approx. 600mm apart and 185mm from each end – these act as a support and fixing point for the seat. Once these are in place, you then need to cut the horizontal pieces to 1000mmm, so they are slightly longer than the basket, and screw into place along the support. You then need to use 2 pieces of wood approx. 40mm wide to form a border around the front and sides of the gabion, and fix them to the ends. In this case we only needed to cover 2 ends as the back and 1 side would not be seen. For the planters I used 450mm, 375mm and 300mm gabion baskets and simply cut the top mesh panel to size to suit each flower pot so they could be dropped into place during filling. Gabion planter made from 450 x 450 x 450mm gabion baskets. It was a lot of hard work preparing for the show, especially setting up the stand on the Friday but it was well worth it. We would like to say a huge thank you to Trecarne Quarry for giving us the beautiful stone to fill the baskets and to everyone else who helped out along the way. Despite the rainy start, and even though we almost lost the gazebo altogether on Saturday morning in the wind, it was a really good weekend and the weather soon cleared. We had a lot of great feedback on the gabions; it’s interesting how many people in Cornwall have a pile of stone just sitting in the corner of their garden that they have no use for…and now they do!! 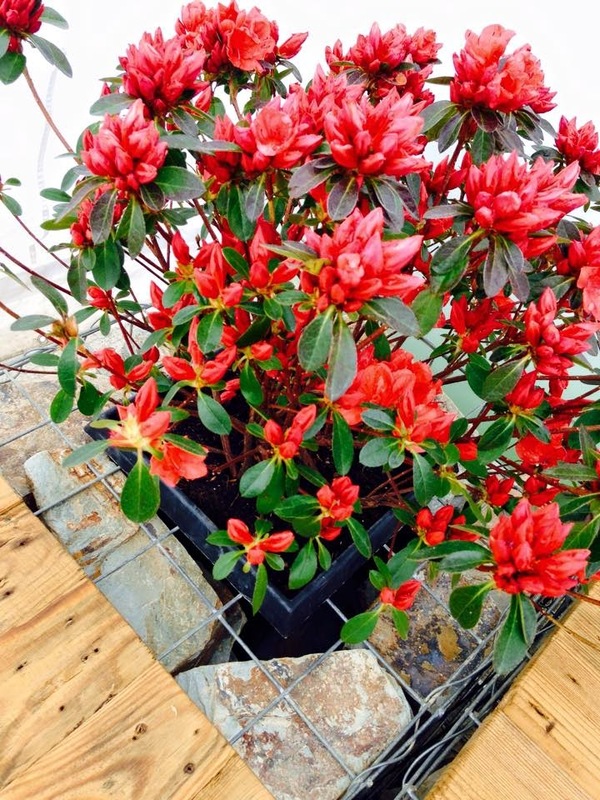 If you would like to browse our range of garden gabions and see how you can transform your garden, visit our shop.